A brief Military Honors service will be held at 4pm. Charles (Pete) Raymond Peterson Jr., age 74 of Traverse City, died March 31, 2019. Pete was born on April 12, 1944 in Atlantic City, NJ to Charles Raymond and Catherine Leavitt (Adams) Peterson. A proud U.S Army Veteran, Charles earned the Silver Star, Distinguished Flying Cross, Bronze Star, Purple Heart and an Air Medal. 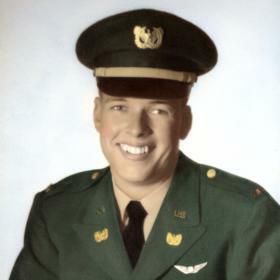 He was a member of the Vietnam Helicopter Pilots Association. 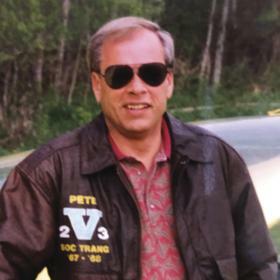 Pete was an Engineer and in Sales with Ex-Cell-O, Cone Drive and Textron. Pete enjoyed soaring, Westerns, crosswords, building models and trains, drinking coffee while mowing in 90 degree heat, and checking his eyelids for holes. He was a Hospice volunteer and always lending a helping hand to his kids and grandkids. Pete is survived by his wife; Amy (Caslmon) Peterson; they were married on April 11, 2015 in Traverse City; brother, Robert Peterson; sister, Sue Monaghan; son, Charles (Chip) Peterson III; son, Jeffrey Peterson; daughters Lindsay Steffes and Kirsten Horton; grandchildren, Charlie, Will, Emily, Perrin, Rhett, Grant and Ema. An informal gathering will be held from 3pm to 6pm, Saturday, April 13, 2019 at Life Story Funeral Home, Traverse City, A brief Military service will be held at 4pm. Memorial contributions may be directed to Vietnam Helicopters Pilot Association. Please visit www.lifestorytc.com to sign the guestbook and share your thoughts and memories with the family.